Décor takes to the streets of the Barrio de las Letras. For four days the streets are filled with flea markets featuring vintage, second-hand, or exclusively designed furniture á la Portobello Road. Antiques also take centre stage in this fair that takes in food decoration as well. The window displays in the area are dressed up for the party and are like small art installations made by the designers and decorators. 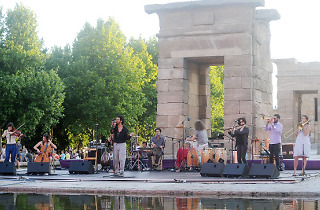 Summer nights in Madrid perfect for outdoor concerts, dance performances at the Sabatini Gardens with the Royal Palace in the background, plays al fresco with the moon as a backdrop, and other cultural activities by both domestic and international artists. This is definitely the best way to combat the summer heat. 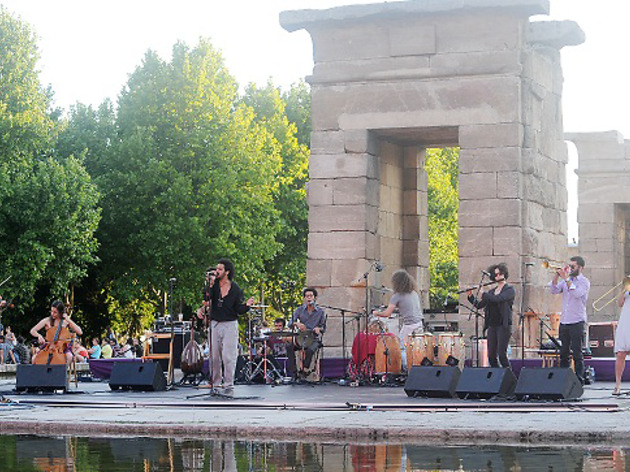 This is the quintessential festival for urban trends in Madrid. For four days lovers of tattoos, music, skateboarding, breakdancing, street art, and similar disciplines meet at the city's fairgrounds to share experiences with their colleagues as well as the public. Among the dozens of activities organised are live concerts, contests, and exhibitions of urban sports, like BMX and roller skating. Circus acts and dance performances will also feature, as well as tattoo workshops. If there's a party that's made the Chueca barrio famous, it's the Gay Pride Festival. From July 2nd to the 6th, hundreds of revellers from all over the world come to join in the celebrations held throughout the neighbourhood, inside and outside various bars and clubs. During Gay Pride ('Orgullo Gay') week, there's an exception made to the no-drinking-in-the-street law, and you can quench your thirst with plastic cups of beer and 'calimocho'(red wine and Coke) the bars sell. The main attraction is the big parade of floats carrying drag queens, dancers and proud party people that runs along Gran Vía. The festival of San Cayetano gives way to several weeks of popular celebrations in different districts of Madrid. The festival is celebrated on August 7 (day of the saint's death), although the party starts a few days before and carries on for some days after. Traditional Madrid clothing and dances, lemonade, and locals dancing in streets adorned with lanterns are the main attractions of these celebrations, along with a lot of general whooping it up. Another traditional summer street festival, on August 10, the Plaza de Lavapiés and C/Argumosa are filled with celebrators having something to drink in the makeshift terraces set up with picnic tables as music is pumped into the barrio from various bars, and the most daring dress in typical Madrid costume. The atmosphere is as festive as it is overwhelming. The big day is August 15th, the Virgen of Paloma, but La Latina starts getting dressed up a few days before. As authentic as its two predecessors, the festivals of San Lorenzo and San Cayetano, food and drink stalls fill the streets, as does music. Only the most cunning will find a place to sit. All the locals who haven't already fled the stifling summer heat grab their mates and head to the festival, where fun is guaranteed. One of the most important cultural events in the city is organised by Arte_Madrid, an association that sets up some of Madrid's top galleries, including Ivorypress and Juana de Aizpuru. During the month of September, the beginning of the art season is celebrated with an inauguration along with their exhibitions and an extensive programme of activities including guided tours, meetings, lectures, and parties, along the lines of New York's or Berlin's Gallery Weekend. Formerly known as the Pasarela Cibeles, Mercedes-Benz Fashion Week hits Madrid's catwalks every new fashion season to give us a peek at what's hot for the coming months. The most important Spanish designers and leading international fashionistas will come together in this vortex of models rushing around getting their make-up, hair, shoes, accessories and clothes changed faster than Superman in a phone box. You can be sure to find plenty of parties associated with Madrid's most stylish week of the summer. Madrid's top music festival is shaping up to be even better than last year's edition. It's on in the Complejo Deportivo Cantarranas at the Universidad Complutense de Madrid and is a huge hit among the locals, and indeed indie and rock music fans who travel from all over to attend. Dcode used to take place over two days, but since 2013, it's all packed into one Saturday in September when the weather's still nice in the capital and perfect for beers and chatting on the lawn between concerts – not to mention the incredible line-up. Artists confirmed this year include Jake Bugg, Bombay Bicycle Club, Russian Red, Vetusta Morla and Anna Calvi.